For the majority of us across the country, this winter has been long and cold. I know there are some people that have been enjoying the snow and chill, but I'm beyond ready for the freezing temps to move on. In the meantime, I appreciate that are ways that I (and all other busy women) everywhere can fit in a little zen-like pampering as a way to provide that elusive calm, relaxing feeling that we all desire during this stressful season. Although my schedule (and wallet) might not allow me to spend every week at the spa, that doesn't mean that I can't have the same experience right at home thanks to Bath Soap Express. A trusted source for bath soap bars, body lotion, shower gels, and more, Bath Soap Express provides the most luxurious bath products in conjunction with only the best pricing and service available. Launched in 2010, BathSoapExpress.com pride themselves on providing customers with everything from face and skin care to San Francisco Soap Company bars to linen sprays — and everything in between. Considering that I am an instant fan of any company that states "We believe that every person deserves a little bit of pampering - moms especially!" 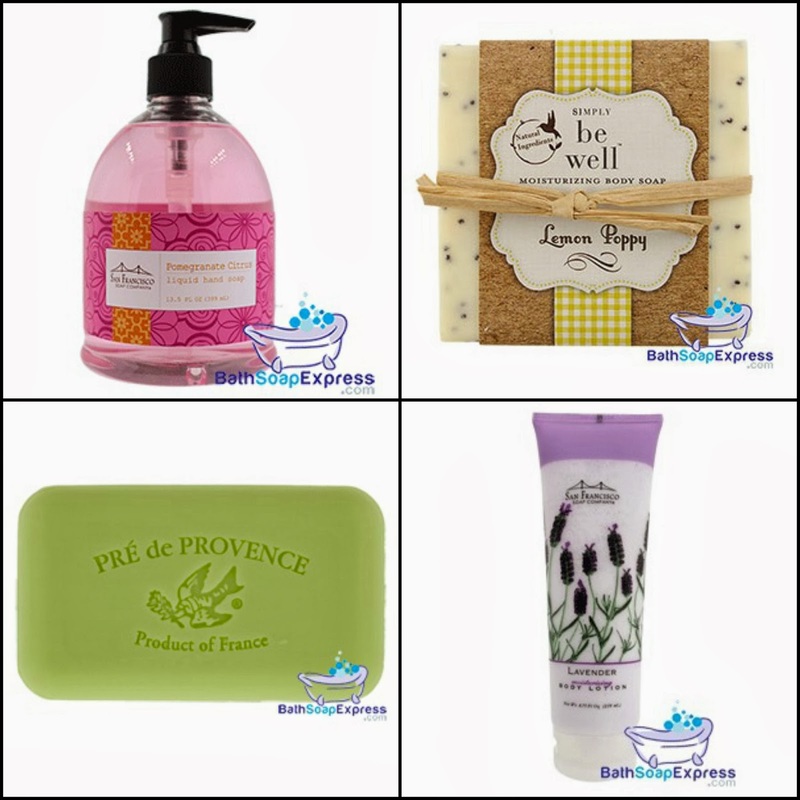 I was happy to begin browsing at Bath Soap Express to find out more about a few of their favorite products. Due to the amount of stress and irritation you put your skin through on a daily basis, doesn't it deserve a little indulgence? Bath Soap Express thinks so and their selection of Body Butters are just the thing to turn that dry and unhealthy feeling into a smooth, soothed, scented softness. 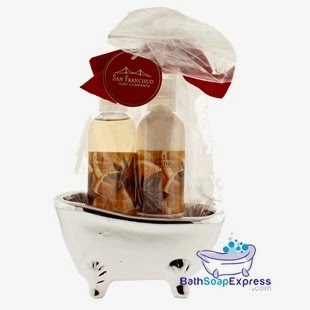 I love that BathSoapExpress.com offers citrus as well as floral scents so that every shopper can select their favorite, and that a full 8oz container of body butter is made in the USA and retails for an affordable $6.99. Taking the fight against bathroom odors to the next level, Poo-Pourri Deodorizers are the hilarious-but-effective air fresheners and spray toilet items that ensure that you never again experience the embarrassment of leaving a bathroom or public restroom in a less than stellar aromatic condition. Simply spray before you go and the Natural Essential Oils create a film on the surface of the water, trapping odor at it's source. Instead of attempting to mask smells and ending up with a chemical odor that only lets everyone know you tried to hide it, Poo-Pourri is the preventative bathroom solution that everyone needs (even if they claim that they don't)! Retailing for $14.95 for a 4oz bottle or $16.95 for a gift set (an organza bag containing Poo-Pourri cleverly tucked into the core of packaged toilet tissue), this is one product that ends up being practical and useful while also having a humorous and unique twist! Finally, when it comes to relaxation and cleansing your mind as well as your body, is there anything better than a soothing bath with a moisturizing bath bar? San Francisco Soap Bars are known for being created using only the finest ingredients and producing fragrances that can only be called radiant. Bath Soap Express has the perfect selection of scents to pamper your skin for daily use or for a special stress-free bath occasion. And, priced at only $2.75 per bar, don't you (or your gift recipient) deserve it? With such a wide variety of high quality products and exceptional service, Bath Soap Express is sure to wow you with the incredible overall experience they provide. Luxurious products plus employees that do everything it takes to give customers the satisfaction they deserve? You've got to head over to BathSoapExpress.com (and connect with them on Facebook, Twitter and Pinterest) to check this out for yourself! One lucky person will win a $25 gift certificate to Bath Soap Express! A big thank you to Bath Soap Express for providing a gift certificate for one lucky giveaway winner. The opinions shared are my own and honest and if you really need to see more, click here to see how I roll. Right now my favorite bath product is Dove Pomegranate body wash. I am a lover of any sort of bath salt. Relaxing in the tub with a good book is my all time favorite past time!! Checking out their site, I would love to try their Cranberry scented soap. Sounds great!! I love anything that body butter. So luxurious! !! My favorite is dove body wash. I love bath salts, especially fruit scented. I like the Pre de Provence Sunflowers Quad-milled Shea Butter Enriched Soap Bars. I like my Sweet Pea shower gel. I really like creamy body washes, usually with either a sandalwood or fruit base scent. my absolute favorite is japanese cherry blossom from bath and body works. I love the Satsuna product line from The Body Shop. Thank you for another super giveaway opportunity. Please keep up the terrific blogging. I love handmade soaps. I'd love to try the Crushed Blueberry Bar. I love Coconut Water fragrance for Body Wash and Body Lotion. It smells great. I love the Cetaphil Bar Soap. I would love to try the Vanilla Orchid shower Gel and body butter! I love any kind of bubble bath. The Vanilla Orchid seems like it smells amazing! My favorite is Bath and Body works shower gels. They smell so good and they scents stay with you. Love my Avon bath stuff and my Joico Reconstructor. I don't have a favorite yet. But I love to use them all! I like body butters for my skin. I love the cherry blossom body wash from Bath and Body Works. dove body wash is great! I like a good shower gel. I love bubble baths and body butter! I love any kind of bubble bath and body spray! My favorite is the Almond Milk Bar. My favorite is Crushed Blueberry Bar. Thanks! I love Laliscious body scrubs. I am using Dove Shea Butter bodywash. I love a good bar of Lavender vanilla soap for my tub soak. Any kind of fruity bath or body wash is what I prefer. I love Dove pink soap, it makes skin feel so soft and clean, I also like Bath and body works products, but have been out for a while. i love citrusy bath gels!!!! I use a vanilla scented bath lotion. I gave poopourri as a funny gift! I like body wash with grape seed oil. I love the Body Shop's Satsuma body polish. It's so refreshing. I love just about anything from Bath & Body Works; enjoying their Mango Melon body wash now. I love hand made bar soaps. I like Kiss My Face olive oil soap. I so want to try the san francisco co. soap in the kiwi melon scent....I love scented soaps. I love body wash with a great lather. I love anything that bubbles in the bathtub. I love taking baths. So anykind of bubbly bath product I love. Cucumber melon, and the sweet flower ones I go for the most. Neutrogena pink grapefruit acne fighting body wash! I would like to try the sunflowers soap bar. My favorite bath body product is Oil of Olay body wash.
Leave a comment on this blog post telling me your favorite bath/body product. I like the poo pourri the best, I think the Heavenly Sent gift set is my favorite. i love anything that smells good. i like to make my own soap with essential oils sometimes. I like handmade soaps that you can get on Etsy or a local shop. I am in love with bubble bath stuff! I typically get it from Bath and Body Works. I love scented bar soap! I love Trader Joe's milk and honey bar soap! It leaves my skin so soft. I've been looking for a body wash that does the same. I love my Dove body wash. Other than that, I do not have anything I really love. Coconut Mango Body Butter sounds wonderful! I'm currently enjoying Dr. Bronner's. I use suave body wash. I love scented body lotions and body washes - preferably something fruity-smelling. French milled lavender scented soap is my favorite. I like anything earthy and/or spiced with a hint of floral. I love the look of any of the bath salts, but would especially love Verbena Bath Salts. Fresh Sugar Lemon Shower Gel is the best! I like any really thick, rich lotion. The thicker it is, the better. As far as scents go, I think ones that sort of fruity. I rotate my body washes - I love them all! I love anything that can be used in the bath (bath oils, salts, bath bombs, etc) because I love taking baths and the aroma of the bath! I've gotten into small-batch artisan soaps lately. I love Yardley lavender body wash. It's my favorite. I am a big fan of sugar scrubs. I love any kind of bubble bath and I love sugar scrubs. I LIKE A REALLY NICE SHAVING GEL. I love many different soap, salts,and scrubs that exfoliate my skin and leave it feeling renewed and glowing. Many comment on my smooth skin and I always tell them the products I use. I like sugar and honey for a body scrub. I have always loved the little moisturizing beads, because I have found they are quite effective. I really love shower gels. I love ocean/beach scented soap bars! I like neutrogena body wash right now. I would love to try their Body Butter. I think it would make my skin soft. I love adding some essential oils for a little aromatherapy in the tub. I use the hand soap from Victoria Secrets. I recently won some moroccan oil body soufflé and its the best stuff that's ever touched my skin. I have some bath salts in vanilla, it is awesome!! i like the acure face cleanser that i use. My Favorite Bath product is EPSOM SALT and ginger!